In the midst of my crazy world, today was a pretty uneventful day. Most people would enjoy that…it’s making me kind of nervous. EEK! Car update – I am still in my rental car. Or should I say A rental car. I took the first rental car back because it felt like I was driving around in an ashtray on wheels. Ironic since there was a large “NO SMOKING” sticker on the dash. But who am I too judge? The latest on the car is that the service manager will drive it overnight and report back. Between you and me…I am not feeling it. I see a new car in this Tubie’s future. Tyler bought a new car last weekend and his check engine came on last night. So during my car lull, we took his car to the shop to get checked out. Turns out it is something small and all is ok now. If only all car stories ended like that? I saved today to make some phone calls I had to make. Since I was about 12 years old, people have not understood me when I tell them my name is Joey. I don’t know if they think there is no way I could have a boy’s name or if I just say my name wrong. I am honestly starting to believe I say my own freaking name wrong. I remember calling my first boyfriend’s house for the first time (we were 12…it was a phone relationship) and his mom gave him the message that “Jelly” called. What the? I know my parents were a little wacky to name me Joey but Jelly is just a golden ticket to bullying on the playground and years of therapy. 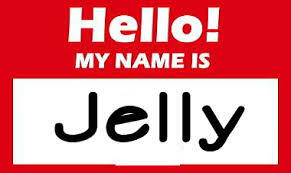 As if it isn’t bad enough that my name is JOEY…but JELLY? Who the hell would name their little girl…Jelly? The Jelly name has continued to plague me through the years. In the business world, I received Fed Ex packages to Jelly. I received voice mails asking Jelly to get back to them. And more recently, VW called me Jelly yesterday on the phone. As Joey, I often receive mail to Mr. or calls asking for my husband or have nurses and doctors walk in to my hospital room, look at me and walk away confused and then come back again. I know the game so I just say, Yes – I am Joey, you have the right room. Most times I can say I have enjoyed going through life as a Joey, not so much a Jelly. Maybe I should think about speech therapy. At 43, maybe I should finally learn to pronounce my name. I think I will put that on my calendar right after my CT scan, pain management appointment and next chemo treatment. I can say that the stress of the whole car situation seems to be taking a toll on me. Don’t know if I told you yet but stress is not a friend to Scleroderma. Stress can quickly cause a “flare up”. I feel that a flare up is on the horizon so I have decided to lay low for the next few days, rest as much as I can and try to avoid stress. That is so funny. Avoid stress. I have had doctors tell me to avoid stress. It is laughable! It’s like, oh ok, I never thought of that. I will just stay in bed and hide under the sheets. Stress won’t find me there. HA! Well…the hubby just got home from work. Time to put my wife hat on and enjoy the quiet time while I have it. It NEVER lasts long! Wait…what was that honey? Your car is doing what? His appointment is on Friday.